Starring: Billy Crystal, John Goodman, Steve Buscemi, Helen Mirren, Alfred Molina, Sean Hayes, Nathan Fillion. Written by: Daniel Gerson, Dan Scanlon and Robert L. Baird. I am a huge fan of Monsters Inc. I don’t think there are many who aren’t. So the level of excitement to be reunited with Mike Wazowski and James P. Sullivan was very high. Maybe they shouldn’t have been because the prequel, Monsters University, doesn’t come close to reaching the joyfulness of the original. In fact, I would say, it’s one of this year’s biggest disappointments and I am fearful that the magic that Pixar once had, has gone. Mike Wazowski always dreamed of being a scary monster and he gets his chance to learn about just that at the illustrious Monsters University. 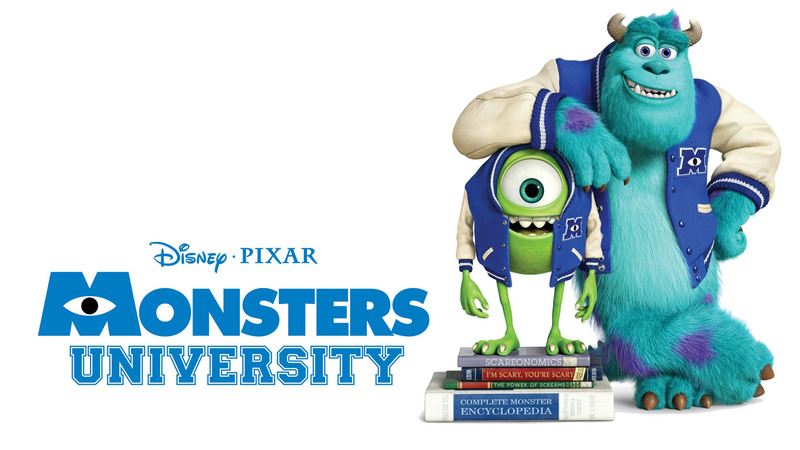 Getting into Scare Programme, Mike forgoes all the things that make university life so important by studying but he accidentally meets James P. Sullivan, a member of a long line of scary monsters who, during a fight, gets both him and Mike thrown out of the scare programme. The only way the two monsters can get back is to take part in the Scare games but they have to be part of a fraternity. The only ones who will have them are the Oozma Kappa, a bunch of misfits who everyone thinks are losers. Will Mike and Sully manage to work together and win the contest? This is the first of many problems with the film. Being a prequel, we already know what the outcome will be and thus, there is no suspense or tension. Prequels are hard things to do and so maybe it would have been better if Pixar had just made a straight out new sequel, then at least we wouldn’t know what is going to happen. Secondly, the first film had so much going for it. It was funny, it was cute but more importantly, it had heart. Even the toughest sole in the world couldn’t help but melt at Boo, the little girl who escapes into Monsters Inc. world. The relationship between Mike and Sully is a dream creation. Their friendship is hard to beat. So watching how they become friends isn’t as touching and of course, there’s no Boo. It also takes a long time to get going. The laughs are very few and far between. Monsters Inc. was a very funny film, mainly because Billy Crystal and John Goodman are a terrific comedy pairing and bounce off each other so well. We don’t get that till 30 minutes into the film. When the gags do start coming, they are more light chuckles instead of big belly laughs. The supporting characters, while amusing, aren’t half as interesting as those in the first film either, apart from Dean Hardscrabble, the dragon-like principal of the school. Voiced by Helen Mirren, she hides in the shadows and is genuinely sinister. The story relies far too much on that well-worn plot device of bonding as a team during a sporting event, something that is churned out time and time again. Pixar have always been the masters of originality, even if the stories haven’t been the most original but this comes across as tired and old hat. Two things sprang to mind while watching this. First was the short film shown before, The Blue Umbrella, was an absolute delight and shows exactly what Pixar can do without a hint of dialogue but brimming with invention. The second was how good Despicable Me 2 was. I laughed consistently throughout that. Here I didn’t and I should have and it feels so wrong that a Pixar film, a company I could almost be certain could pull off anything, have failed. When you think of Up, Finding Nemo, Toy Story and their sequels and the original Monsters Inc, you laughed, you cried (at the drop of a hat…see Up!) and you came out in a much happier place. Here, you don’t. The 3D also doesn’t work. Where Despicable Me and its sequel used the extra dimension to its best advantage and had fun with it, after a few minutes you forget you are wearing it is in this format and you might as well just go and see the 2D version instead. Look, it’s not a terrible film. It looks fantastic, as so it should and the combination of Crystal and Goodman does work when they are together. It’s just that we have come to expect so much from the brilliance of Pixar that you want much more than they have offered here. So while the younger audiences will probably get a lot out of it, fans of the original and Pixar will feel short-changed and very disappointed.